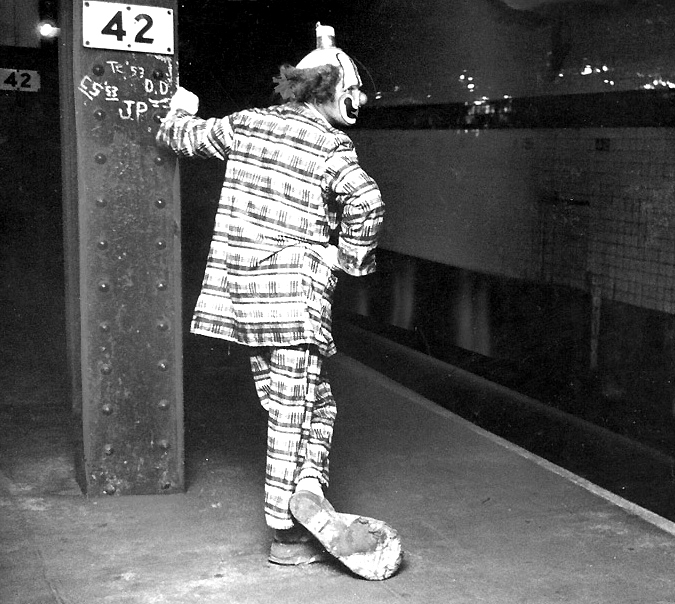 Another unique and happy childhood memory shared by many of us who grew up in our little town in the 1950s or early 1960s was our very own hometown clown known as Jazzbo (or Jolly Jazzbo). Born May 13, 1927, and a resident of Oceanside for over 36 years from the age of 18 months until 1965, Edmund A. Tester, Sr. was almost a native of our little town. He lived at 33 Fairview Avenue, one street south of Davison Avenue (behind the library). Tester was a member of OHS's class of 1946. 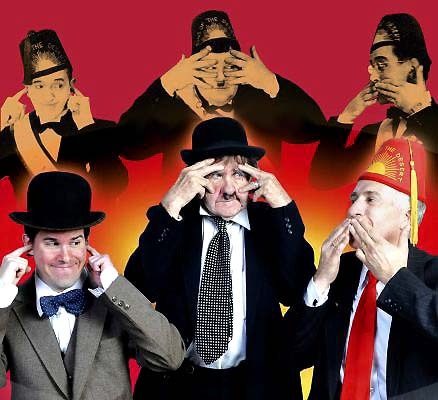 He started his career as a circus clown and was soon performing with well-known entertainers, Abbott and Costello, Martin and Lewis, Jack Benny and Eddie Cantor. He is also a magician, an artist and a writer. 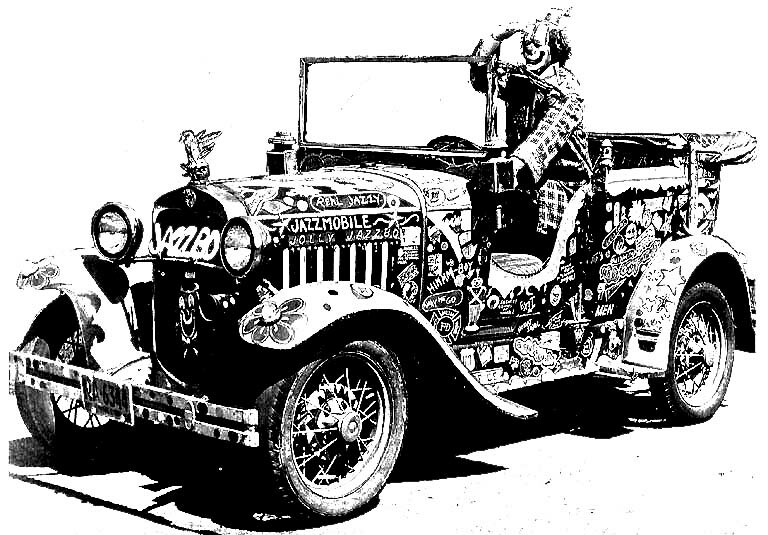 But most of us knew him only from his appearances as Jazzbo at local events in our little town and in the streets of our community in its popular, annual Memorial Day parades from 1947 to 1960, usually in his colorful clown car (pictured below) that was known as the "JAZZMOBILE," a 1930 Model A Ford that Jazzbo told me bought in 1953 for $65. 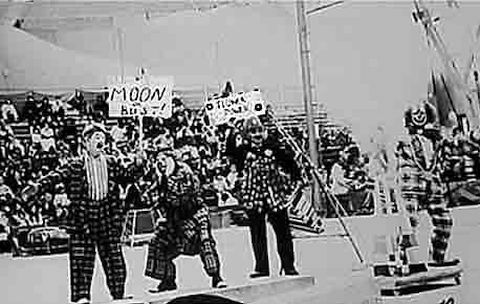 Jazzbo (at right) under the big top (probably in the late 1960s) ̶ heading for the moon! 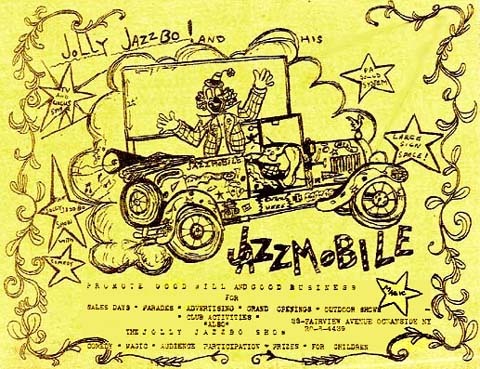 Two years after our Roadside Rest became Nathan's, the "Kiddieland Park" area next door was taken over by Jazzbo, and it was renamed "JazzboLand." 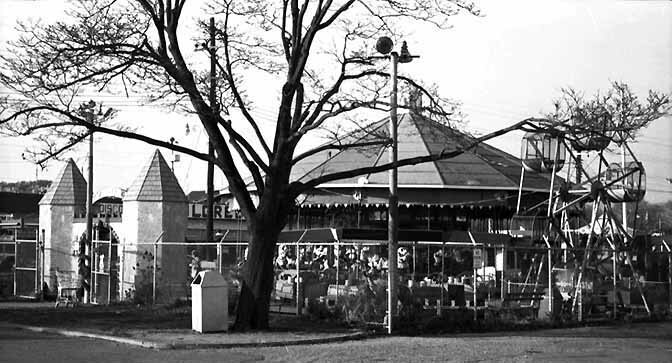 From 1961 until it closed in 1965, Jazzbo operated the little amusement park and appeared there regularly entertaining the local kids. 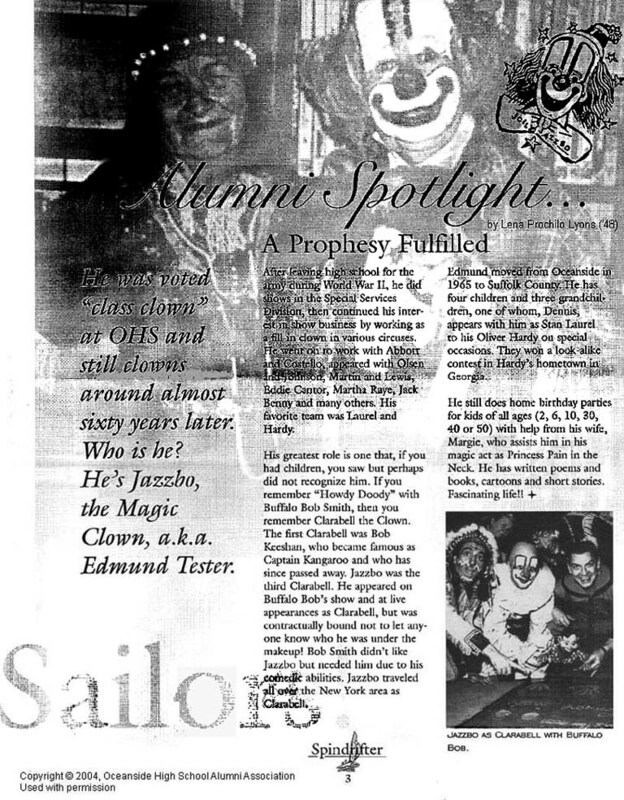 The following 2004 article, published by the now defunct Oceanside High School Alumni Association in its newsletter, Spindrifter, tells us a great deal that we probably did not know about Jazzbo. I believe many people of Oceanside remember you fondly, and that they would enjoy recapturing some of those memories by reading about you on the worldwide web. And I believe you deserve to continue to be remembered. Tell me, how did you get the name, “Jazzbo”? What were some of the unusual things you did when appearing in our Oceanside Memorial Day parades? 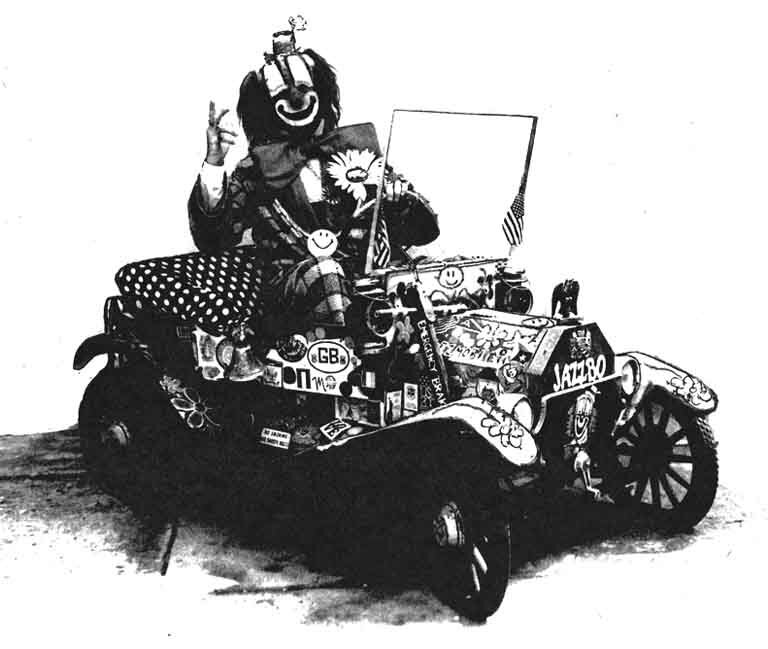 In the early days of the parade after WWII, I created floats for it, like Iwo Jima. Sometimes, I wore costumes other than my clown clothes, for example, General Douglas MacArthur. Did anyone pay you for that? No, it was all volunteer work, a labor of love. 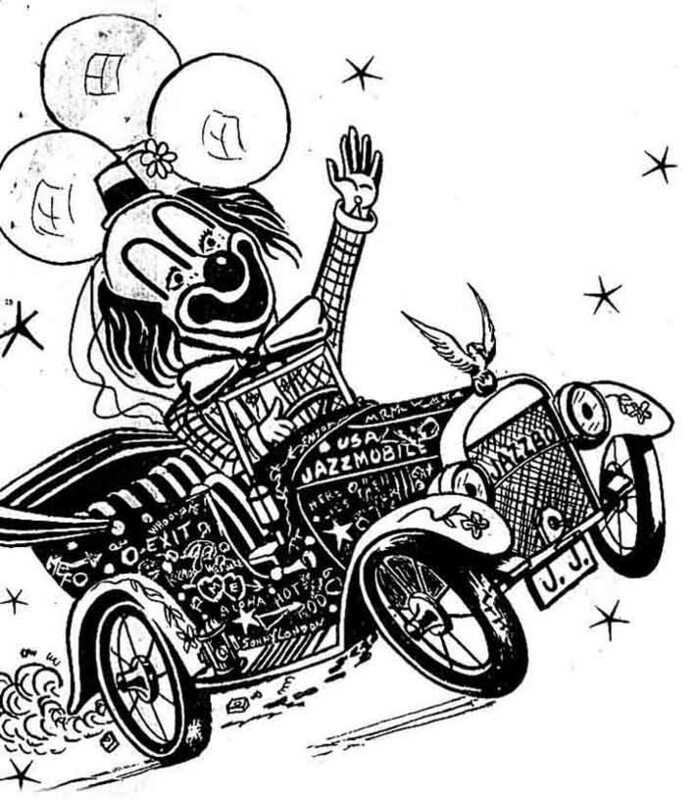 How were you able to drive the "JAZZMOBILE" with those big clown shoes on? With great difficulty. It wasn’t easy. 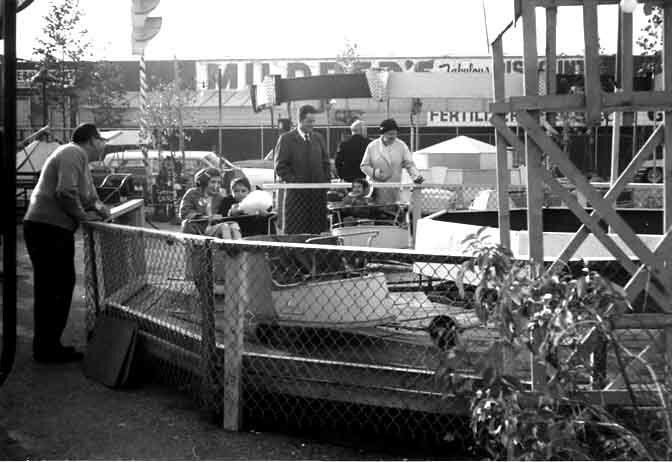 What other types of community or other local events might people remember seeing you at in the 1950s? Mostly Kiwanis Club events. Once, I appeared as the Frankenstein monster. In 1957, I also organized the first daytime community-sponsored Halloween celebration for the Oceanside Recreation Department. I appeared at children’s birthday parties all over New York, New Jersey and Connecticut. Why was your identity kept secret when you played Clarabell? I made personal appearances as Clarabell for several years when Bobby Nicholson* was playing him on the TV show. Bob Smith wanted the world to think there was only one Clarabell. One last question. How would you like to be remembered by the Oceanside residents of the 1950s, particularly the kids? If I left my audience laughing, I was happy. I loved Oceanside. important part of its history. And we remember you. On behalf of our class, 1960 Sailors Association Inc. has arranged for Jazzbo to receive, as our gift, a copy of the pictorial history book, Oceanside, autographed by the author, our friend, Richie Woods (class of 1976). 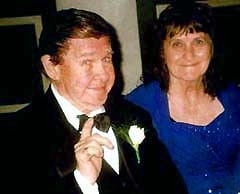 Ed Tester (sans clown make-up) and his now late wife, Margie, on the occasion of their 60th wedding anniversary, October 4th, 2006. 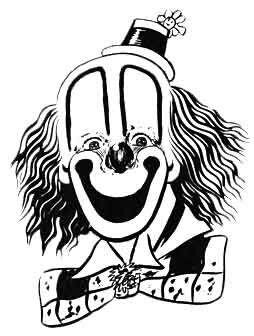 EDITOR'S NOTE: A search through available internet and other published sources identified only three actors who played Clarabell during the history of the Howdy Doody Show from 1947 to 1960 (or subsequently), none of whom were Edmund Tester. The most famous was Bob Keeshan (who later became Captain Kangaroo), and then there were Bobby Nicholson and Lew Anderson (in that order). Click here to read more about Jazzbo in Newsday's extensive obituary. Copyright © 2007, 2011, 2012, 2014 and 2018 by Howard B. Levy and 1960 Sailors Association Inc.